Clearly Logic Pro is geared for the studio, while MainStage has the DNA to utilize the sounds and other stuff you build in Logic and take it to the stage in a more performance-friendly package. But have you wished that Logic would work more like MainStage, so that you wouldn’t have to give up some of the inherent benefits of Logic – such as realtime playback of MIDI notes, track automation, etc.? I have. And I struggled with giving those up just for the ability to define concerts, sets within the concerts, and songs/mixes within the sets… then easily move between then without having to “load” each song/mix. But could you imagine standing in front of a crowd and clumsily moving to your laptop between each song, loading a new project in your Logic session, waiting 5-10 seconds for the core files and plugins to be loaded into memory, and then move back to position to begin?? No way, total deal breaker. However I really wanted Logic’s strengths and features. So I began investigating ways to make that scenario I described less painful…and I think I found a very usable solution. 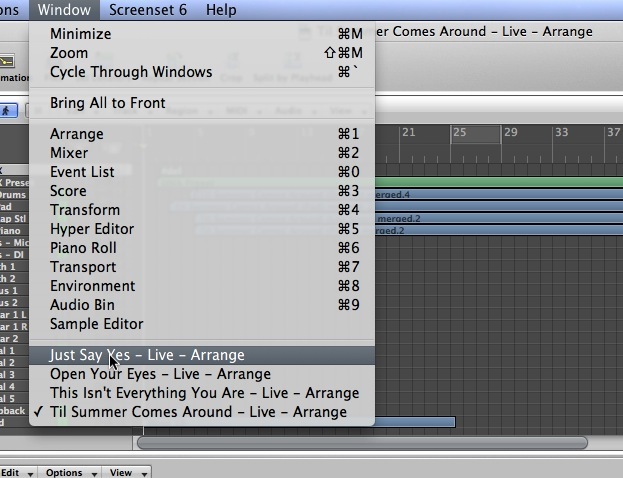 Each of my “songs” for a gig are in individual Logic projects. So I began playing with the idea of pre-loading all of the projects for a set, and having them open already within my Logic session. Bingo. My laptop can easily handle it, especially considering 1.) I’m more often than not using 90-95% of the same plugins for each project – created custom channel strips for vocals, guitar, bass, etc. – and 2.) the laptop’s CPU is only processing the ACTIVE project (the one with focus) at any one time. Ok, so I have all of my songs for a set open. Now how would I move from one to another easily, like patches, without having to physically move to the laptop and start clicking away? 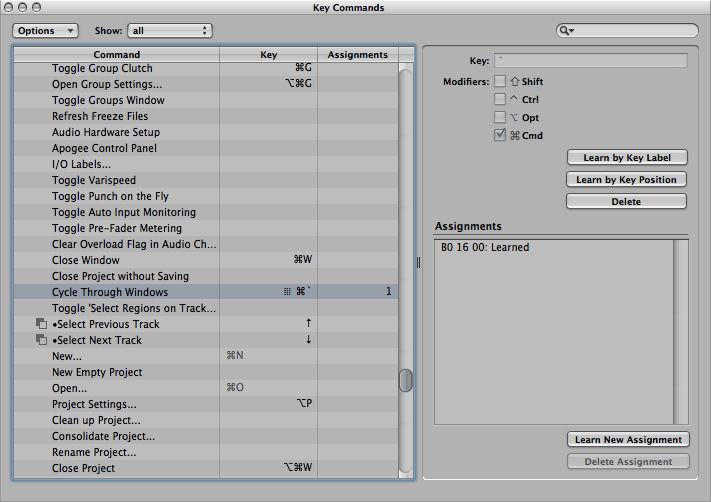 Well, Logic’s Window menu has an option to Cycle Through Windows with a corresponding Key Command. That got me thinking: could I map a MIDI controller event to that Key Command, no different than mapping a MIDI event to transport controls, volume faders, etc? Answer: yes. Look in the Global Commands section or just do a quick search for “Cycle Through Windows” and you’ll find that command listed. 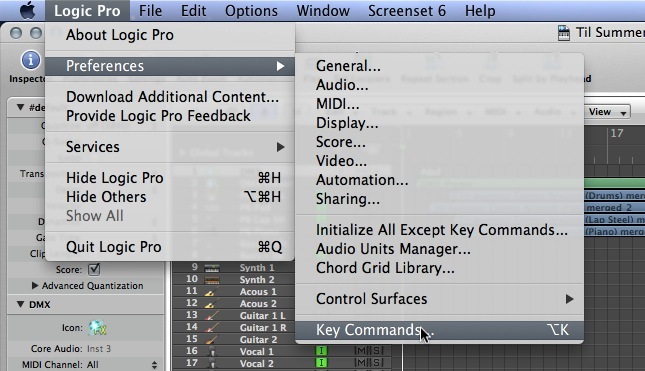 Then you can have Logic learn the MIDI command you want to use to trigger that Key Command. Piece of cake, and works great. So now you can cycle through Logic projects (as long as they are pre-opened) similar to cycling through patches/songs in MainStage and use all of the benefits of Logic in your live performance. There are more cool tricks I’ve learned, which I’ll share soon. If you have some good ones, I’d love to hear them. Comment and let us all know! This entry was posted on July 17, 2013 by davealloway2001 in Live Performance and tagged Apple, Live, LogicPro, MainStage, MIDI, Music.